Requesting specific toys (with links), banning other gifts and threatening invitees if they choose the wrong presents may not be the best ways to make friends. But this is exactly what one couple did when creating a birthday email outlining the rules and regulations for their son’s first birthday. How would you react if you received this email? This email was sent last week by a couple hosting their child’s first birthday party and posted through Reddit. 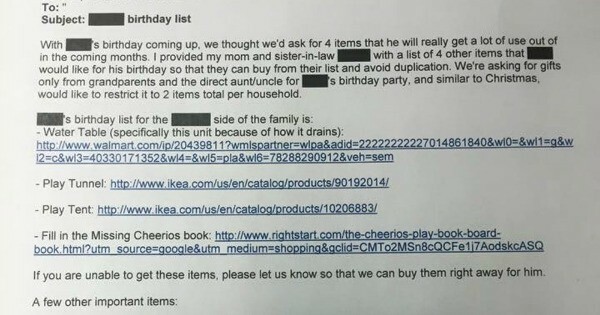 As well as requesting very specific items from their family and friends, the parents also have a lengthy list of what toys to avoid. 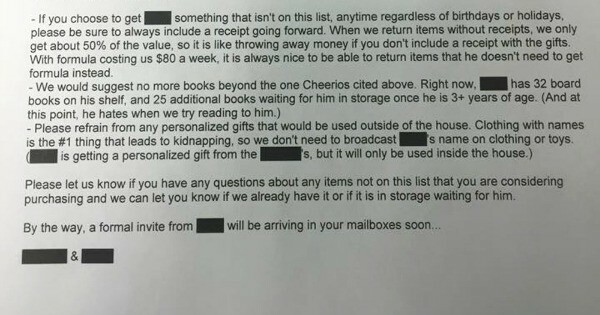 Perhaps warning that their child might be kidnapped if he receives certain gifts and suggesting that not including a receipt for gifts will lead to the denial of baby formula may have been a little too much? 1. Chill out. They are one. They won’t remember who wore what, what food was served or how the birthday cake tasted. 2. Do not demand specific gifts. Most one-year-olds will be happier playing with the wrapping paper and the box the toy came in. 3. Re-gift or donate unwanted presents to a children’s charity. Rather than request receipts or ask for specific gifts, simply keep the gifts in the packages and decide what to do with them down the road. 4. Keep it simple (and short). Anything over three hours is just too much, especially for a one -year-old. So plan for a small gathering at a park for an hour or have a BBQ at your house for a couple of hours. 5. Save the expensive entertainment for later. Hiring clowns, petting zoos or magical fairies to come to the house is a little lost on a troop of one-year-olds. A group of six-year-olds, however, would love any of these ideas! Keep the business cards of your favourite childhood entertainers for a few years later. 6. Celebrate the day. Sure, first birthdays are for the children but they also mark a great milestone for new parents. You survived the first year! 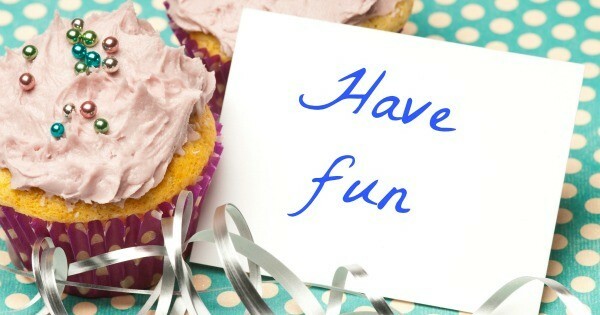 Congratulate yourself and enjoy the day. You made it through the sleepless nights, the self-settling and the transition to solids. And the rest of the parenting journey is down hill from here, right? Ha! 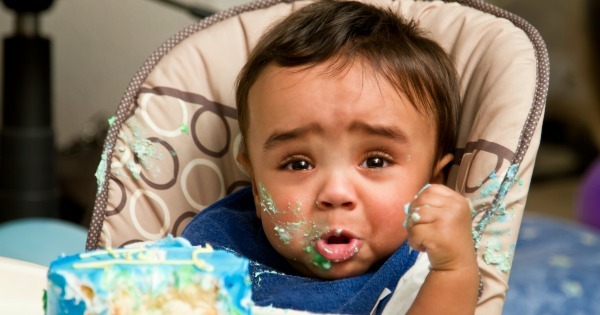 All parents want their child’s first birthday to be memorable and most likely do not want a house full of unwanted toys (especially of the singing variety), but there is certainly a line when it comes to birthday party etiquette. What do you think – did these parents cross it?